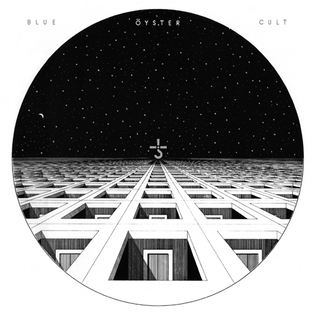 "Astronomy" is a song by rock band Blue Öyster Cult that has appeared on several of the band's albums. It was first released on their 1974 album Secret Treaties . Their second live album, Some Enchanted Evening , included a version with an extended guitar solo and a third version was included on the Imaginos album. It was also re-recorded for the band's Cult Classic collection in connection with the TV miniseries of Stephen King's The Stand . 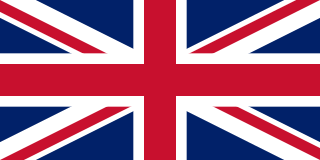 Most recently, the song was included on the A Long Day's Night album. Blue Öyster Cult is an American rock band formed on Long Island, New York in 1967, perhaps best known for the singles "(Don't Fear) The Reaper", "Burnin' for You", and "Godzilla.” Blue Öyster Cult has sold more than 24 million records worldwide, including 7 million in the United States alone. The band's music videos, especially "Burnin' for You," received heavy rotation on MTV when the music television network premiered in 1981, cementing the band's contribution to the development and success of the music video in modern popular culture. "Waves of the Danube" is a waltz composed by Ion Ivanovici in 1880, and is one of the most famous Romanian tunes in the world. The song has many variations throughout the piece, reminiscent of the music of Johann Strauss. Through the Viennese style variations, there is still a distinct Slavic style. In the United States, it is frequently referred to as "The Anniversary Song", a title given by Al Jolson when he and Saul Chaplin released an adaptation of the song in 1946. The song's lyrics are selected verses from a poem by Sandy Pearlman, the band's producer and mastermind behind their image, called "The Soft Doctrines of Imaginos". 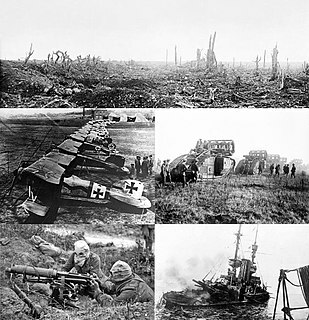 In the poem, which was later partially released under the BÖC moniker in the album Imaginos , aliens known as Les Invisibles guide an altered human named Imaginos, also called Desdinova, through history, playing key roles that eventually lead to the outbreak of World War I.
Samuel Clarke "Sandy" Pearlman was an American music producer, artist manager, music journalist and critic, professor, poet, songwriter, and record company executive. He was best known for founding, writing for, producing, or co-producing many LPs by Blue Öyster Cult, as well as producing important albums by The Clash, The Dictators, Pavlov's Dog, Space Team Electra, and Dream Syndicate; he was also the founding Vice President of eMusic.com. He was the Schulich Distinguished Professor Chair at the Schulich School of Music at McGill University in Montreal, and from August 2014 held a Marshall McLuhan Centenary Fellowship at the Coach House Institute (CHI) of the University of Toronto Faculty of Information as part of the CHI's McLuhan Program in Culture and Technology. 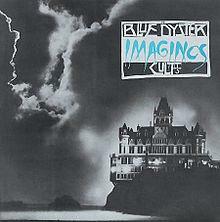 Imaginos is the eleventh studio album by the American hard rock band Blue Öyster Cult. It was released in 1988, and was their last recording with their original record label, CBS/Columbia Records. The album took nearly eight years to complete and was originally intended to be the first in a trilogy of solo albums by Blue Öyster Cult drummer and songwriter Albert Bouchard. Bouchard was fired in August 1981, and CBS rejected the album in 1984, but a re-worked version was eventually published as a product of the band. Many musicians contributed to the project over this eight-year span, including Joe Satriani, Aldo Nova, and Doors guitarist Robby Krieger, but some band members were barely involved in the recording process. Thus, Imaginos is often considered more as a project of producer and lyricist Sandy Pearlman than as a true album of the band. Cassiopeia is a constellation in the northern sky, named after the vain queen Cassiopeia in Greek mythology, who boasted about her unrivaled beauty. Cassiopeia was one of the 48 constellations listed by the 2nd-century Greek astronomer Ptolemy, and it remains one of the 88 modern constellations today. It is easily recognizable due to its distinctive 'W' shape, formed by five bright stars. It is opposite Ursa Major. In northern locations above latitude 34ºN it is visible year-round and in the (sub)tropics it can be seen at its clearest from September to early November. Even in low southern latitudes below 25ºS it can be seen low in the North. Sirius is a binary star and the brightest star in the night sky. 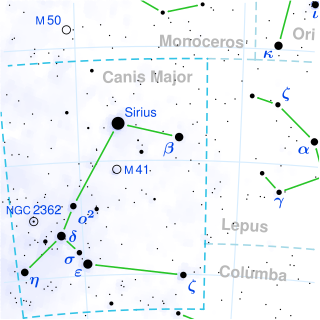 With a visual apparent magnitude of −1.46, it is almost twice as bright as Canopus, the next brightest star. The system has the Bayer designation α (Alpha) Canis Majoris. The binary system consists of a main-sequence star of spectral type A0 or A1, termed Sirius A, and a faint white dwarf companion of spectral type DA2, designated Sirius B. The distance between the two varies between 8.2 and 31.5 astronomical units as they orbit every 50 years. Imaginos (performed by Blue Oyster Cult) - A bedtime story for the children of the damned. From a dream world, paralleling our earth in time and space, the invisible ones have sent an agent who will dream the dream of history. With limitless power he becomes the greatest actor of the 19th century. Taking on many ingenious disguises, he places himself at pivotal junctures in history, continually altering its course and testing our ability to respond to the challenge of evil. His name is 'Imaginos'. 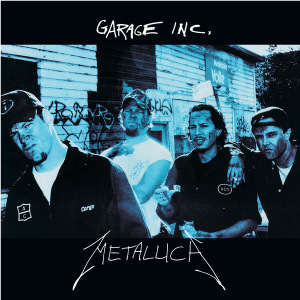 Metallica did a cover of the song for their 1998 Garage Inc. album. Arch Enemy used the chorus for their song "Pilgrim" from the Burning Bridges album. Albert Bouchard's band the Brain Surgeons recorded the song for their 1997 album Malpractise with Deborah Frost on lead vocals. Albert's post-Brain Surgeons band Ünderbelly released a version of the song with original Soft White Underbelly singer Les Braunstein on lead vocals in 2011. Burning Bridges is the third studio album by the Swedish band Arch Enemy. This is the first Arch Enemy album to feature Sharlee D'Angelo on bass and the last studio recording to feature vocalist Johan Liiva. The music here showcases the band's wide interpretation of the death metal genre to include portions of melodic death metal, progressive metal and grindcore. A music video was released for the song "The Immortal." 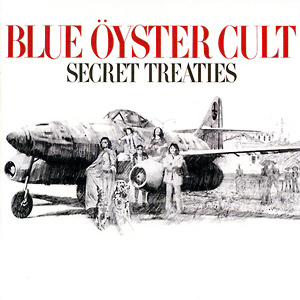 Secret Treaties is the third studio album by American hard rock band Blue Öyster Cult, released in 1974 by Columbia Records. The album spent 14 weeks in the US album charts, peaking at No. 53. It was certified gold by the RIAA in 1992. 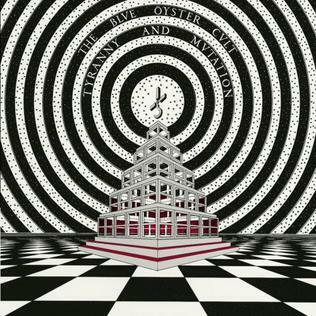 Tyranny and Mutation is the second studio album by American hard rock band Blue Öyster Cult, released on February 11, 1973 by Columbia Records. It was produced by Murray Krugman and Sandy Pearlman. On May 12, 1973, the album peaked at No. 122 on the Billboard 200 chart. "(Don't Fear) The Reaper" is a song by American rock band Blue Öyster Cult from the band's 1976 album Agents of Fortune. The song, written and sung by lead guitarist Donald "Buck Dharma" Roeser, deals with eternal love and the inevitability of death. Dharma wrote the song while picturing an early death for himself. 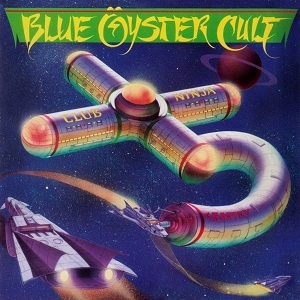 Club Ninja is the tenth studio album by American hard rock group Blue Öyster Cult, released December 10, 1985 in the United Kingdom and on February 11, 1986 in the United States. The album was intended as a comeback for the band, whose previous album The Revölution by Night failed to attain Gold status following the success of 1981's Fire of Unknown Origin and 1982's Extraterrestrial Live. Club Ninja sold more than 175,000 copies, falling well short of gold status again, and because of its high cost, Columbia Records executives deemed it a commercial failure. The album was re-issued on compact disc on March 10, 2009, by Sony-owned reissue label American Beat Records, which had also reissued the band's 1988 album, Imaginos. A Long Day's Night is a live album by American hard rock band Blue Öyster Cult, recorded in Chicago, Illinois, on 21 June 2002. It is so named because that day was 2002's summer solstice, the longest day of the year. Donald Bruce Roeser, more commonly known by his stage name Buck Dharma, is an American guitarist and songwriter, best known for being a member of Blue Öyster Cult since the group's formation in 1967. He wrote and sang vocals on several of the band's best-known hits, including "(Don't Fear) The Reaper," "Godzilla" and "Burnin' for You." Eric Jay Bloom is an American singer, songwriter and musician. He is best known as the lead vocalist, guitar and keyboard/synthesizer player for the long-running band Blue Öyster Cult, with work on more than 20 albums. Much of his lyrical content relates to his lifelong interest in science fiction. Joseph J. Bouchard is an American guitarist and bassist. He was the bassist for Blue Öyster Cult during their most successful period. Albert Thomas Bouchard is an American drummer, guitarist, singer and songwriter. He was a founding member and drummer of the American hard rock band Blue Öyster Cult. Allen Glover Lanier was an American musician who played keyboards and rhythm guitar. He was an original member of Blue Öyster Cult. He resided in Manhattan. Workshop of the Telescopes is a two-disc compilation album by the American band Blue Öyster Cult, released by Sony Music/Columbia Entertainment in 1995. All of the material on this album was recorded prior to the Imaginos sessions; some of it was previously only available on promo discs, and a few others were previously unavailable on CD. St. Cecilia: The Elektra Recordings is a compilation album by the American rock band Stalk-Forrest Group. The tracks were recorded in 1969 and early 1970, but not officially released until 2001. The album compiles all the recorded output by the group that was recorded for Elektra Records during their short tenure with the label. "Joan Crawford" is a song by American hard rock band Blue Öyster Cult, from the band's 1981 album, Fire of Unknown Origin. The song was a moderate success, reaching #49 on the Billboard Mainstream Rock chart. The subject of the song is the actress of the same name, who had died four years before the song's release. A music video was created for the song, which was famously banned by MTV for featuring a sexually suggestive scene.